The development in modern industrial production is driven by fierce competition according to Ed Brown, CEO and Founder of Topper Industrial. Brown, who holds various patents in regards to material handling equipment advancements, suggests that both innovation and cost control are two important factors for success. Lean production, including continuous improvement achieved with kaizen events, as well as Six Sigma and Theory of Constraints, benchmark the reality of market-driven developments including shorter product life cycles, and extreme SKU proliferation. European manufacturing plants constrained by space have been utilizing the Fork Truck Free process for more than two decades. As North American manufacturing plants are forced to deal with more frequent product changes and fluctuating production volumes. Each product must be produced at a lower cost to be able to reach profitability during its short life cycle. Brown insists there will be less room for investments in product-specific equipment. North American manufacturers who use reliable fork trucks as the backbone of materials handling are demanding flexible solutions that easily adapt to an increasingly unpredictable market. In the warehouse a fork truck free environment permits the ability to change pallets without the need for a fork truck since the pallets on rigid pallet carts are ready to be picked up by a regular tugger, or more advanced mother/daughter train solution, pioneered by Topper Industrial. In the preparation area, the space available for storing parts at the production line is almost always extremely limited. Parts need to be prepared before delivered to the preparation areas. Only the parts that are required for a specific product and assembly station at a specific time should be delivered. With the proper customized kit carts dedicated for specific parts can be created or off-the-shelf solutions in a variety of configurations may accomplish this staging process. In the pre-assembly area, materials can be stored and present in a efficacious manner. 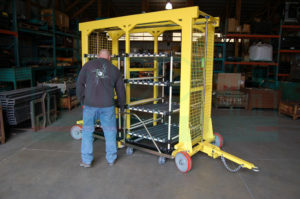 Often complex or ETO (engineer-to-order) manufacturers utilize a combined kit cart and assembly fixture that also works as a transport cart to the final assembly line. Integration between steps in the intralogistics process is the quintessential trigger to reduce forklifts. As each process on the manufacturing plant floor is examined, the trends toward Fork Truck Free is sweeping North America. To learn more, attend “Why the Fork Truck Free Movement is the North American 2017 Material Handling Trend,” being hosted by Topper Industrial at Promat 2017 at McCormack Place in Chicago on Monday, April 3, 2017 at 12:45 PM – 1:30 PM in Theater D. The session will also be repeated on Wednesday, April 5, 2017 at 3:00 PM – 3:45 PM in Theater E. To register for ProMat, go to: http://www.promatshow.com/register.aspx?ref=attendees&acid=42396.